Jenny Hawkins, introduced to the team by Sue, has brought her knowledge of wildflowers with her. Because they will be of attraction to visitors alongside planted perenials and specialist trees and shrubs, we are now listing wild flowers that are found on the site, and also wildflowers that have been cultivated and planted. Both these Planting Lists can be found under the Garden Restoration Tab. The Report of the Working Party 18th October (when published) wlll record that this latest wildflower planting is of wild flowers cultivated by Jenny. Light Cloud and a gentle breeze . 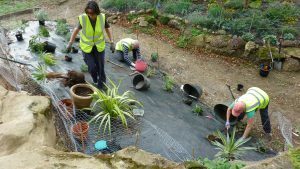 Last month Maydencroft re-profiled The Parsons Bed (see Report of Working Party 20th September) and Sarah and Jenny afterwards relaid the membrane ready for the planting which took place on 2nd October 2018. This month we have to cover the Bed in mulch and, if everything runs according to plan, Maydencroft will deliver a load of mulching material during the week in time for the volunteers to spread it on the bed. A few key volunteers will be missing this Thursday, so we will rely on a good turn out to help shift the mulch. I will bring my wheelbarrow, so hopefully with two wheelbarrows we should be able to build up a momentum. If we have sufficient resources we must use the leaf blower to gather up the recent sudden leaf drop following the high winds. This is something that can be done at any time, if time and resources allow. Of special importance is the need to keep the Perimeter Tree Whips clear of smothering weeds. The full team will meet at the Fernery at 10 a.m.* for briefing and the allocation of tasks; and the issue of appropriate tools. *Volunteers are encouraged to arrive earlier if possible in order to help with the distribution of tools and allocation of tasks, which will facilitate a prompt working start for everybody. If resources allow us to split into two groups, a First Aider will attend each group if possible, but failing that, then the respective leaders will maintain telephone contact. For those not familiar with the location of the Fernery, full details may be found on the website but, simply stated, the closest access point is North Ride, on the Danesbury Estate, AL6 9RD as follows: either park in North Ride, or take the right hand fork of the unmade Road which leads to Danesbury Park Road, and a kissing gate entrance is about 500 metres on the right, not far from a lay-by. A tea break is taken at about 11 am. The Borough Council Environment Overview and Scrutiny Committee, comprising Councillors with Officer support, are due to visit The Fernery at 2 pm on Wednesday 24th October. 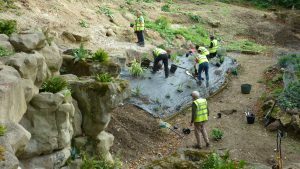 It would be convenient if one or two volunteers could be on site to welcome them, and to be available as informal guides if such are required. If you are able to attend, please use the WhatsApp Fernery Gardening Group to confirm your intentions. On a bright morning, eight volunteers turned-out for an ad hoc meeting arranged via the WhatsApp ‘Fernery Gardening Group‘** . 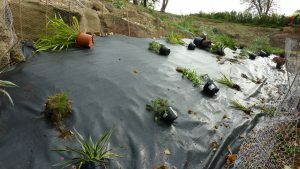 The single task was to work with Sarah, our Garden Adviser, who had laid the plants in position in the newly profiled Parsons Bed, and to start planting them. The Parsons Bed is in the sun for longer periods of the day, and is therefore drier than the Central Bed. Sarah’s planting objective therefore is to plant ‘Tropicals’ in the Parsons Bed which will thrive in those conditions, using plants that the Victorians themselves would have chosen for that position, and designed to complement the planting in the Central Bed. Together with purchased stock plants, some beautiful plants were donated by the volunteers themselves. yucca gloriosa, purple sage, cistus, sedums, carex grasses, phormiums, euphorbia, bluebell ‘river’ ferns (various) including dryopteris and asplenum. It is planned that the Borough Council will bulk deliver material to the site, timed for mulching to be a main task at our next Working Party on Thursday 18th October 2018. 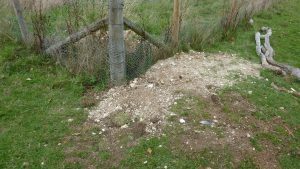 At the 20th September 2018 Working Party, Mark with Maydencroft’s digger, opened up the two large holes in the cattle fence on the East side of the site, in preparation for the scouts to effect a sound repair by making a wire ‘envelope’ into the ground, and up the existing wire fence. 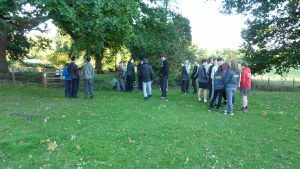 Explorer Scouts waiting to be briefed on the task. 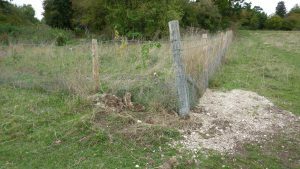 On Monday 24th September Explorer Scouts (in great numbers – 26 in total) completed the task of laying the wire and tying it to the existing fence, before filling in with soil. The scouts divided into two groups who, in rotation, shared the task of actual wiring up, whilst the others were entertained with a 30 minute guided tour of the Fernery itself. It was very gloomy when the work was completed at 7.15 pm and the more enterprising scouts had to use torches on their mobile phones to see how to stack the unused wire, tools and the wheelbarrow back in the shed. The Fernery volunteers are grateful to the Scouts for their help, and these photos taken a few days later show what a good job they did, under the direction of Keith Ingrey, their leader.